Make your walks more effective with these tips. Walking is one of the most popular forms of exercise—and for good reason. It’s simple, free, accessible, and easy on your joints. Unlike other exercises, there’s no special training or fancy equipment needed. All you need is a supportive pair of walking shoes and you’re good to go! Maybe you like to walk your dog around the neighborhood, take a walk on your lunch break, or stroll around your neighborhood with a friend. Or maybe you prefer to book it on the treadmill. The time and place don’t matter, what matters is that you’re moving. 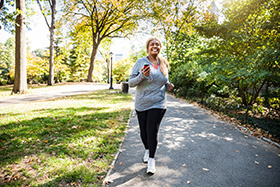 While walking may not be as effective at burning calories as running or weight lifting, you can still lose weight and improve your fitness with regular walking workouts. If you’re looking to improve the effectiveness of your walks, here are a few tips to step things up a notch. The faster you walk, the more calories you’ll burn. A comfortable walking pace is between two-and-a-half and three-and-a-half miles per hour. At this pace you can expect to walk a mile in less than 24 minutes and burn 200 to 300 calories within that time. Pick up the pace to five miles per hour and you can walk a mile in less than 12 minutes. With a brisk pace like this, you can burn up to 550 calories in an hour. If a brisk pace isn’t sustainable, that’s okay. Alternating between a slower pace and a brisk pace provides a highly effective workout. Called high-intensity interval training, you’re able to exercise longer and harder (and therefore burn more calories) when you alternate between low- and high-intensity exercise. Walk at a moderate pace for 30 seconds and then a brisk pace for 30 seconds and repeat. Or you can walk one length of the block at a moderate pace and then next length at a brisk pace. Whether you’re walking around your neighborhood or on the treadmill, include a few hills as you go. Walking uphill uses more upper body movement and adds resistance, thus increasing your calorie burn. The greater the incline, the more energy it takes to climb. Don’t have hills in your neighborhood? Walking on sand or up stairs is also more challenging than flat ground. Get more out of your walks by engaging your arms. Swinging your arms helps you take quicker steps and gives your upper body a workout as well. Bend your arms at a 90-degree angle and swing front to back. To keep from over-swinging, make sure your hand doesn’t go past your hip when swinging back or higher than mid-chest when swinging forward. Your elbows should be kept close to your body. Put in your earbuds and listen to your favorite upbeat music as you walk. The music may distract you from feeling tired, the tunes may improve your mood, the beat will encourage you to keep pace, and you’ll enjoy the sound of the music. One study found that those who listened to fast-tempo music while walking walked 15 percent longer than those who walked without music. You’ll be more successful at losing weight if you log your workouts. 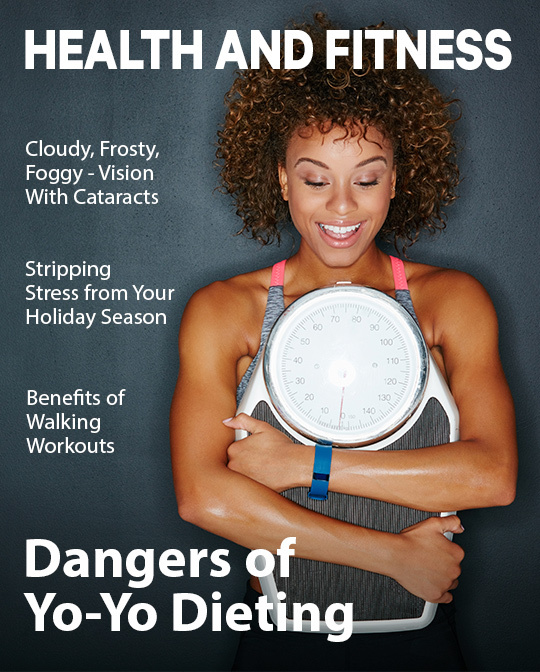 Wear a pedometer or fitness tracker to record your steps and then log them each day. Tracking your distance or number of steps helps motivate you to go farther the next day. It also helps you set goals and track your progress. The average person takes 5,000 steps a day. If this is you, make it your goal to gradually increase your steps until you reach at least 10,000 a day. Walking this far burns 500 calories. Want to walk to your favorite tunes? When making a walk playlist, download songs with 120 to 145 beats per minute to get going at the right speed. About our programs: Mr. America Jason Kozma's Personal Training is a triple threat of body shaping weight workouts, precision fat-loss cardio and holistic nutrition using regular foods. Using his system, you can radically upgrade your fitness, health, appearance and self-confidence. Clients routinely shed 20 pounds of body fat in eight weeks or less, dramatically increase their strength and flexibility, and achieve extreme cardiovascular fitness. Even if you've never had success losing fat or gaining muscle before, our individually tailored program will work for you! Call now at (310) 772-5105 and find out how quickly you can get in the best shape of your life! Visit Mr. America Jason Kozma's website at www.LApersonaltraining.com​ !